Will Brazil’s loss hit Dilma's re-election chances? Editor's note: Carl Meacham is director of the Americas Program at the Center for Strategic and International Studies (@CSIS). The views expressed are his own. Brazil’s humiliating exit from contention in the World Cup at the hands of Germany, and its failure even to take the consolation prize of third place on Saturday, has understandably left Brazilians feeling crushed. Some have gone as far as to describe the host’s defeat as a national tragedy. This is hardly surprising considering the importance of soccer to the nation’s identity. Young boys in Brazil idolize the all-time greats, from Pele to Neymar, whose humble beginnings have inspired a narrative of soccer as an equalizer, a path out of poverty, and an escape from the favelas and the drugs and violence that plague them. The question now is whether the aftershocks of Brazil’s soccer exit will continue to be felt this October, when the country takes to the polls to elect its president. Back in 2007, Brazilians welcomed the news that the country would host the 2014 FIFA World Cup – it was a moment of profound national pride, and Brazilians were thrilled at the prospect of winning the tournament on their home turf.But that enthusiasm faded as the tournament drew nearer – especially as the price tag soared. These concerns developed in the greater context of the political protests that have wracked Brazil since last summer, with protesters largely demanding that the government take meaningful steps to address poverty and inequality in the country – among the most unequal in the Americas. And with these grievances in mind, Brazilians found the exorbitant price of the World Cup increasingly difficult to stomach, particularly given concerns that the construction projects and security improvements would not even be ready in time for the start of the tournament. True, once the World Cup began, soccer took center stage and the country was engulfed by a celebratory and competitive atmosphere as Brazilians appeared to once again embrace the tournament. The stadiums were pristine. Security ran smoothly. All, it seemed, was well – and no one was happier with the success than President Dilma Rousseff. Then came the Brazilian national team’s fall from grace as it was overwhelmed 7-1 by a much better organized and relentless German side.The defeat (and Brazilians’ deeply emotional reaction) fueled speculation over the likely impact on Brazil’s presidential elections this fall. And, with the prospect of a Brazilian victory off the table, many feared that the pre-tournament protests would be reignited. They’ve remained low-key so far, but many still expect Dilma’s popularity, which had been bolstered by the early success of the Brazilian team, to tumble. Of course, a reality that is easy to forget when the country is caught up in the excitement of the World Cup is that Brazil is much bigger than soccer. 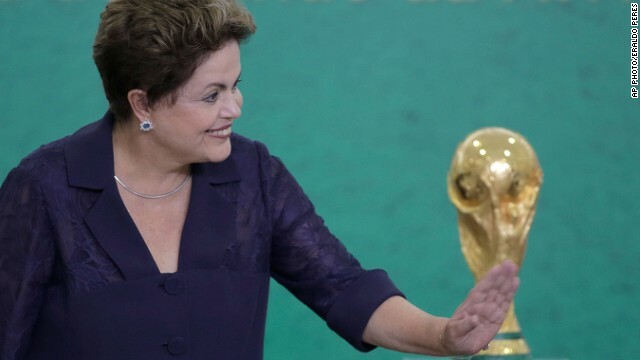 And Dilma almost certainly had much more to gain from a national team victory than she had to lose from their defeat. If anything, history shows that the national team’s performance has little impact on electoral outcomes. In 1998, when Brazil lost to France in the finals, Fernando Henrique Cardoso was reelected in the first round; when they won their fifth title in 2002, Luiz Inacio Lula Da Silva, then in opposition, was elected to his first term. But the political undercurrents to this particular World Cup are unprecedented, and will have been compounded by the ignominy of seeing Dilma hand the World Cup trophy to German captain Philipp Lahm rather than Thiago Silva. Many Brazilians feel they have a common rallying point, one that transcends even soccer. All this suggests that the apparent perfect storm of grievances, discontent and now defeat mean the odds may not now favor the incumbent, and the obscene chants that echoed around the stadium during the Germany defeat could have been an uncomfortable glimpse of what is to come. True, new polling has yet to be completed since Brazil’s defeat, and Dilma remains the favorite in the fall’s elections. But her 4 percentage-point bump when the World Cup began is by no means set in stone – and the 38 percent she garnered in the latest electoral poll is far from enough to guarantee a first-round victory this fall. As the past month has demonstrated, even favorites can find themselves on the wrong end of history. PLAYERS PLAY THE GAME. BUT AS SOON AS WE USE THE GAME TO FURTHER OUR POLITICS, WE HAVE TO SUFFER WITH THE PROGRESS OR REGRESS OF IT. Quite true, but it's important to consider that Brazilians are no longer thinking about the World Cup. As it's said in the article, the country itself is much bigger than soccer – something that is clearer than ever to Brazilians. The fact the Cup turned up well dispite so much bad expectation may be the determinant factor, and I think Dilma will take advantage of that. The problem is not Dilma but the opposition, which is poor of ideas and projects. So, maybe Dilma again. so the opposition poor of ideas ah? yes so does her government and her ever so sky rocketing expenditure and her giving money away to lousy lefty governments like the likes of cuba as an example....and the ever so "mafiocratic bureaucrats that are more present in this government worst than ever before,this world cup is one of lula's ideas of "revamping" the country on the big world scenario even knowing that 50% of the workers in brazil gets paid poor wages and gets exploited with long working hours but long lifle populism? ah !! Peolple will remember the spent money with stadium, rather than using for improve health and education systems. I'm really rooting for Brazil, I want them to do well economically. However, I was really disappointed with Brazilian soccer fans the way they booed their President. She came to support her national team and the fans booed her. I thought it was shameful. Comparing Brazil to Germany, one sees the contrasts. Brazil is a country governed more by emotion and life-styles. Germans in general are rational. They are indoctrinated to work hard and not to live beyond their means. She is the worst President has ruled Brasil. Unfortunatelly she is supporting the left wing to try to drive the country to the bolivarism, similar to Venezuela.